between every rib. | my personal blog where I question everything. It finally happened. 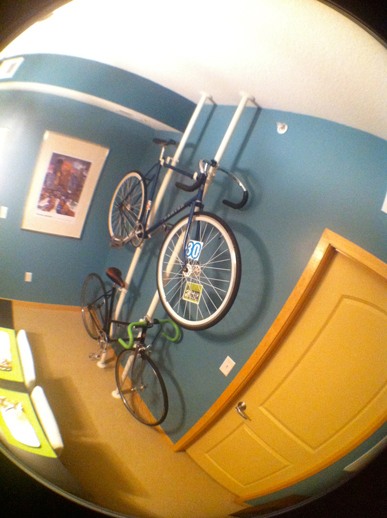 After several attempts – luckily, before we began making holes in walls – we finally found the perfect solution. Loran found the idea on a blog, and it was perfect. A quick trip to Ikea later and we had all of our Stolmen supplies and hardware. 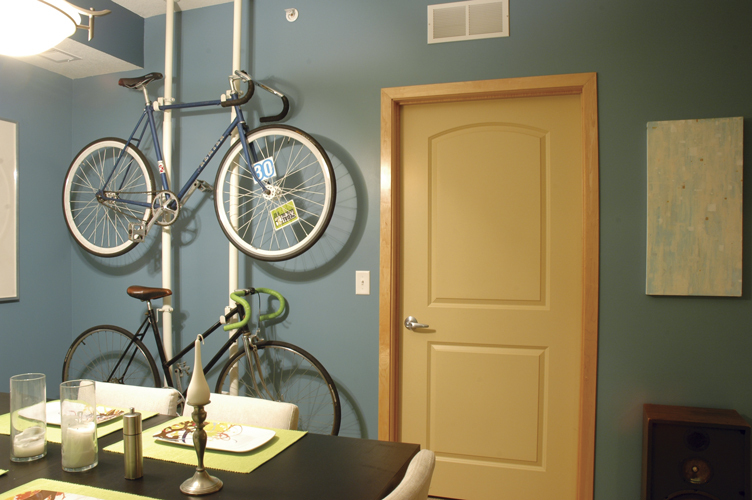 For this project we bought 2 tension poles, a pack of 4 clamps and 4 additional hooks – all from Ikea. It cost around $80, which is more than we originally wanted to spend on this project, but for the convenience of not dealing with putting holes in the wall, and trying to drill into a non-centered stud on the small wall that we had – it was well worth the money. 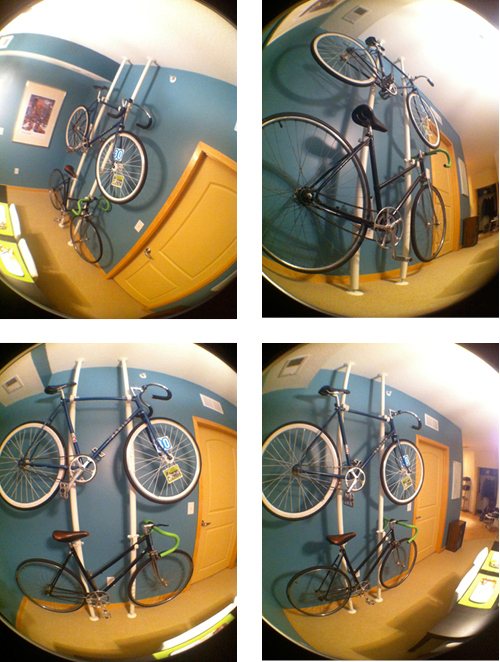 We now have an aesthetically pleasing, functional bike rack that you can vacuum under. It’s perfect for our condo, since we barely have any additional storage. Last Sunday, at the Covenant Church we are a part of, the sermon was on the parable of the good samaritan. A story many people have heard, probably dozens of times if you grew up in a christian community, etc. What I loved about hearing it this time around was how our pastor presented it in a culturally rich, confrontational and self-reflective way. I had never known so much about the one who was testing Christ in this parable, how Christ tended to respond by question and how the challenger at the end wasn’t able to clearly admit, or even say the ‘name’ of who the true neighbor was in the situation, rather he could only mutter “The one who had mercy on him. I hadn’t felt the Holy Spirit so present in my heart during a time of teaching as this in a while. Personally, I pride myself on being a child of God who accepts that people of other, little or no faith can still bring glory to God. This pride is not good. Not in the sense of all people having the opportunity or ability to bring glory to God, but more that I think highly of myself for believing this. This is pride. Getting high off the thought that what you believe is what scripture and God teaches can be extremely dangerous. This is something I feel I will struggle with my entire life. Like many, I feel good when I think (or think I know) I’m right. It’s dangerous. To love is to live through love, by action. Not thought. Not belief. Not solitary. This was humbling on many levels for me. I was facing this teaching in a way that I never had before. I wasn’t necesarrily questioning the core intent of this parable, but the prideful feelings that drown me as I listened. At the end of the parable, and the sermon, our pastor pointed out a new interpretation (to me) of Christ’s question, “Which of these three do you think was a neighbor to the man who fell into the hands of robbers?” The challenger replied, “The one who had mercy on him.” The interpretation was that this wise, expert of the law felt guilt and shame, forced to deal with his pride. He thinks he knows, and he might believe what is right, but his actions did not reflect this. And he felt ashamed to know that the samaritan, one who likely believed something different than he (in our modern culture, possibly a mormon, jehova’s witness, muslim, buddhist. etc.) did the loving thing that brought glory to God. At our church, after the sermon, we enter a time of discussion, reminiscent of a college lecture/discussion-type setting. The question of who we should be a neighbor to, or for how many people we should be a neighbor to came up. We talked about it, expressing feelings of being overwhelmed, or not sure where to cut off our willingness to be a neighbor to someone, because obviously, one person does not have the capacity to love and be a true neighbor to everyone. And then, it was said, don’t ask who you should be a neighbor for, rather, just be. Be a neighbor. Being is action. It doesn’t matter what you think or believe, or how righteous you think you are. Be a neighbor. To all and any that you pass. For there will shine the love and glory of Christ. You can feel as good as you want believeing and hoping for others, but we must act, through love and faith, knowing that the Holy Spirit is with us. Always. So, my most popular post on this blog was my review of my top 10 albums from 2009. It actually got 5,438 views! 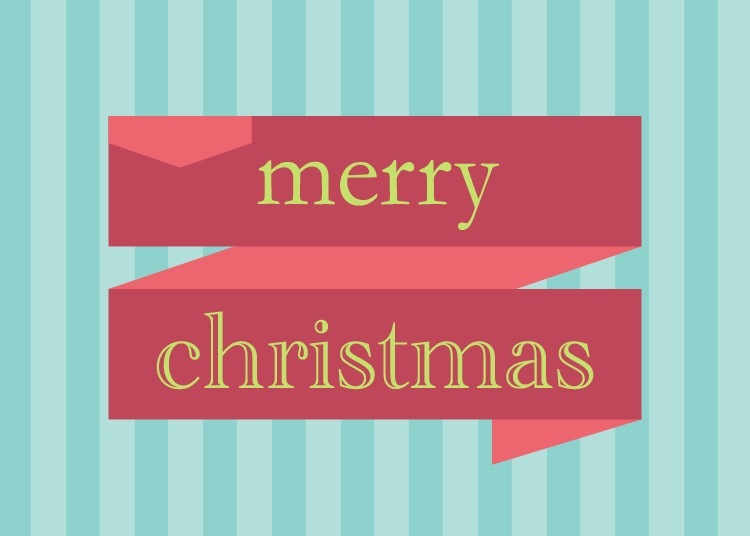 Let’s just say, I’m overdue for my 2010 list – but it’s coming!!! Like last years, it’s going to be hard to narrow it down to only 10, but I’m ready for the challenge. Stay tuned! 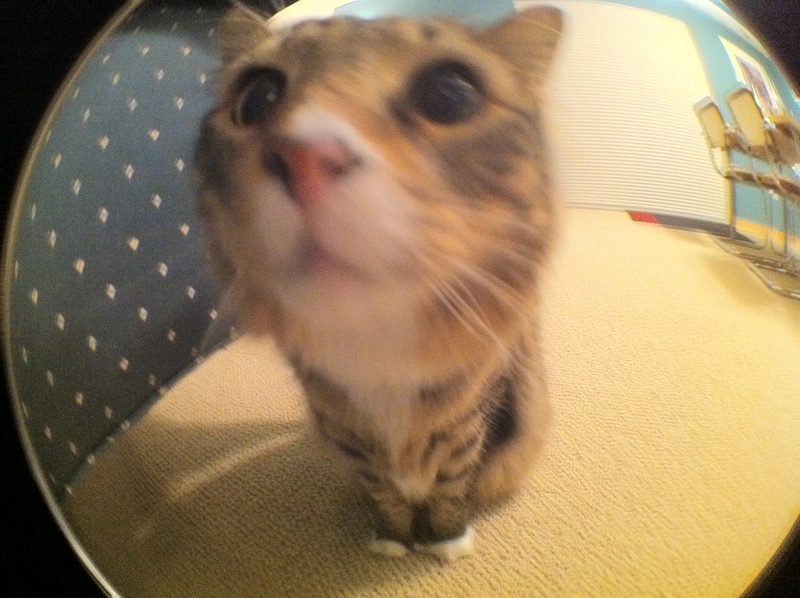 In the meantime, enjoy this pic of my cat Rocky that I took with my new fish eye lens for my iPhone 4. You can buy it here. After the type of week that makes you feel like your tank is on E, I’m excited to finally fully enjoy one of these Rogue ales. 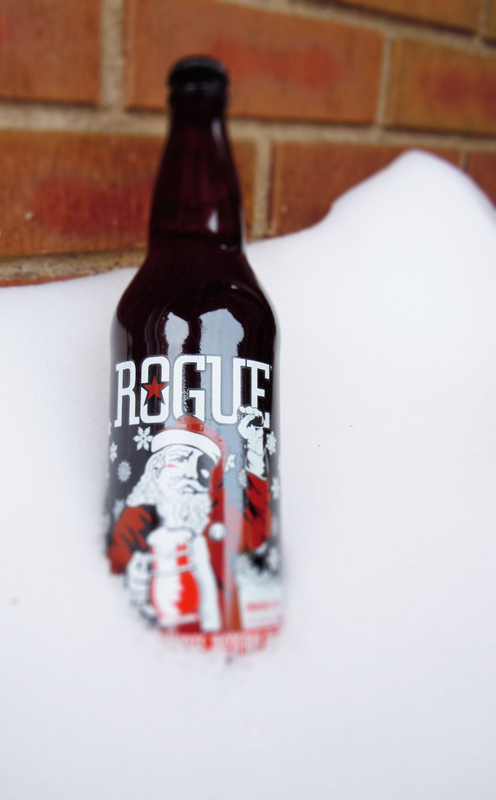 Today it’s Santa’s Private Reserve Red Ale. Pouring this healthy looking, amber/red colored ale, I’m excited that it’s a 22 oz. bottle that needs to be finished. With a healthy head, this 6% ABV and 65 IBU ale has a bitter bite of hops that strangles your tongue until you swallow. Roasted malts, spices and a hint of crisp citrus – I don’t really know what to compare this ale to. But I like it! I thought that it would be a little – excuse my language – ballsier, but it’s still good. I just wish it was a 9% ABV big boy, I think the flavors and richness of the beer would be better complicated with a higher alcohol content. Upon refilling my glass, I come to the conclusion that this is an earthy tasting beer. It doesn’t seem to be an over-perfected recipe, but slightly raw. This is a filling ale, so I don’t think I could drink a ton, but I would love to try it again, preferably paired with a medium-cooked filet mignon! If you like earthy beers – specifically ales – go for this one. Rogue seems to take their craft extremely seriously, and I really respect that. Not to mention, their bottles are the coolest. Read more people’s opinions and reviews at the Uptown Beer Guild! Well, this was definitely my least anticipated of all of the Citizen’s Six-Pack beers, but it was surprisingly tasty. 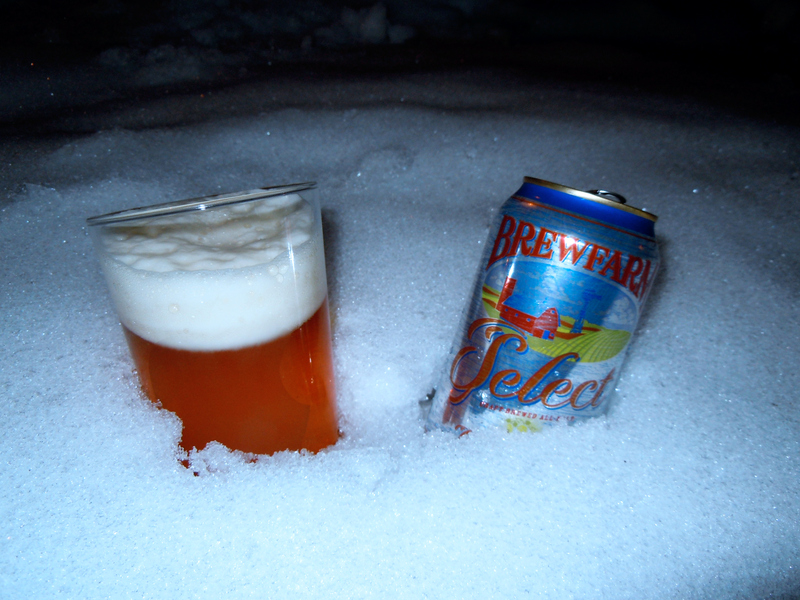 Ok, so a golden lager is not your first choice of brew after MN’s first 7-9″ snow fall, but it did the job. There’s not much info out there about this beer, but you can read the brewery’s blog here. The only one of the bunch in a can, Dave’s BrewFarm Select Golden Lager is 12 full ounces of wind-powered bliss. Not nearly as clear and tasteless as I judged it to be, this 5.5% ABV lager has a deep citrus smell and a mouthful of flavor. Crisply carbonated with a chasing flavor of malts and a hint of alcohol. I don’t recall the price of this lager, but assuming it’s within reason, I think I will for sure pick some up. I must say that this one surprised me the most of all!